Paul Sheehan was arrested for disorderly conduct and may face civil rights charges. 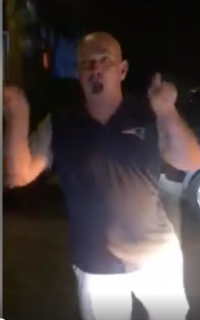 A 54-year-old Dorchester man who was arrested for disorderly conduct last Friday night after going on a belligerent, racist rant against two strangers near Adams Corner could face more serious, civil rights charges, according to Boston Police. Paul Sheehan was arraigned in Dorchester District Court on Monday. He was the person caught on a video taken by an African-American woman who was one of the targets of his tirade. The video, posted on Facebook over the weekend, has gone viral. It shows Sheehan challenging the woman about why she is in his neighborhood and screaming at her and a Boston Police officer who intercedes. In the video, the man calls the motorcyclists “animals” and threatens them with violence if they didn’t “get out of [his] neighborhood." The incident began about an hour after a car pursued by police smashed into a second car and a fence at the corner of Beaumont Street and Adams Street. The confrontation shown on video happened just feet away from the scene of the collision, which was followed by a foot chase and the arrest of a 31-year-old Dorchester man, who was allegedly fleeing police after striking a pedestrian on Dorchester Avenue. According to a police report obtained by the Reporter, Officer James Doiron was blocking traffic at the corner of Chelmsford Street and Adams Street around 10:30 p.m. when he observed the suspect screaming at two motorcyclists, a black male and a black female, who had pulled over on the side of the road. Officer Doiron, upon hearing the suspect — Sheehan— shouting profanities at the motorcyclists, rushed to separate them. The motorcyclists left the scene after explaining to the officer that they were pulled over because of the detour (caused by the earlier crash) and were just trying to figure out where they were going. Sheehan left the scene, but returned and Officer Dorion observed him walking up Adams Street screaming a racial slur and pulling on a traffic sign pole. According the BPD report, Sheehan was repeatedly yelling "F--k that [N-word]." Sheehan was released on personal recognizance and is due to appear back in court in October. According to Officer Steven McNulty, the BPD's Civil Rights Division will be investigating the incident as a potential hate crime. Sheehan is a longtime commuter rail employee. He works for Keolis, the company that operates the MBTA commuter rail. On Tuesday, a process began to remove him from service, according to sources familiar with the investigation. Sources familiar with the Keolis investigation said that Sheehan’s removal from service was the first step in his likely termination from the company. WBUR reporter Simón Rios contributed to this report.